I add sweet potato noodles, shredded chicken, noodles (zucchini noodles) and carrots to it when I make it (and about 2 extra cups of coriander ;) ) and its an absolute winner in our household and with the Intuitive Mothers Circle mums. This recipe was shared with me by a friend and no matter which way I make it, as simply a broth, or a hearty soup, it is my absolute go to. As a broth it can be made in 10 mins and 15 mins if you’re adding vegetables or noodles. PERFECTO! Why its good for you during pregnancy AND postpartum? According to Ayurveda, during pregnancy, heat, fluid and earthiness increases (this makes you feel hot, heavy and fluidy). And after birth, Ayurveda says that fluid is lost, earthiness is lost and heat is lost so you are left with airiness, space and coolness (think about how you felt after birth - a bit spaced out and a bit cooler than normal). The ingredients of this soup are terrific for both pregnancy and birth because they can balance out, or be adjusted slightly to accommodate more for post birth or pregnancy. After birth you might like to add some more root vegetables to add in that earthiness, reduce the amount of coconut cream and increase the ginger and add a bit more sweetness. During pregnancy, you might like to avoid root vegetables and stick with the broth on its own. 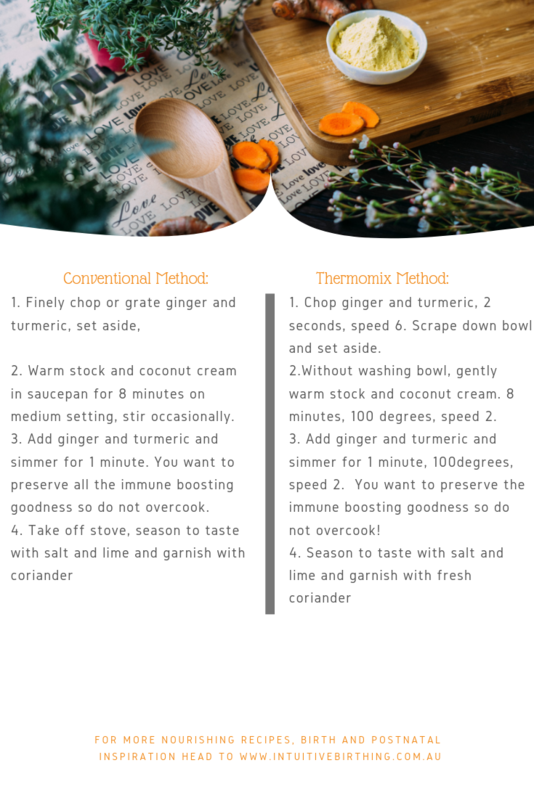 Ginger and turmeric have warming and antiviral properties whilst the chicken broth has the benefit of collagen and other nutrients that line the gut and assist in fighting the bad guys (read- illness). If you are vegan and are choosing a vegetable broth you can rest assured all of those plant based nutrients in your broth are also incredible at helping your body fight the good fight. Coconut cream is slightly cooling for the body but has excellent fat content to sustain you for longer. 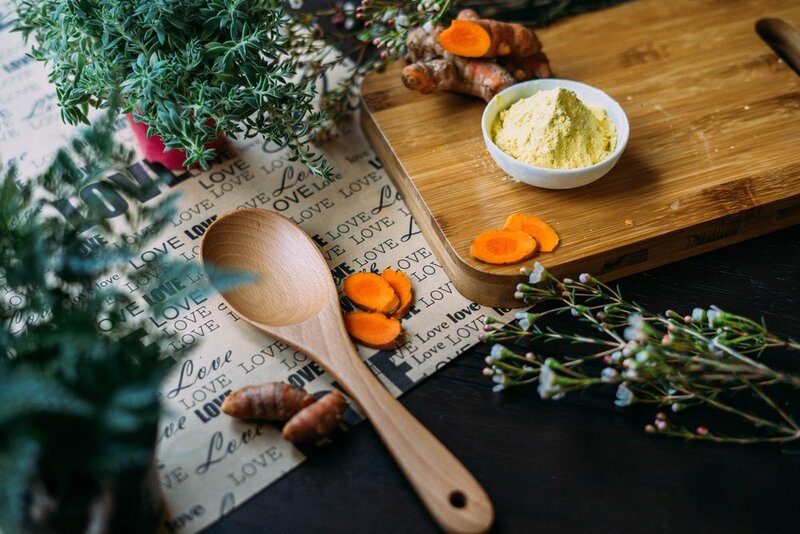 This means that if you’re pregnant, those warming properties of ginger and turmeric aren’t going to heat you up too much, but should perfectly balance the heat in your body. If you’re postpartum with babes in arms, you’ll have lost some heat in your body since the birthing process, so you’ll find this helps to balance out your body heat too.. if you’re still feeling a bit cool, don’t hesitate to add a bit more ginger or something a little sweet to bump your heat a little. Coriander is 100% my favourite herb, it has some wonderful health benefits and contain some really fantastic key nutrients; manganese, magnesium, vitamin C, iron. So even if coriander is the enemy, at least put a tiny bit in or on your broth. 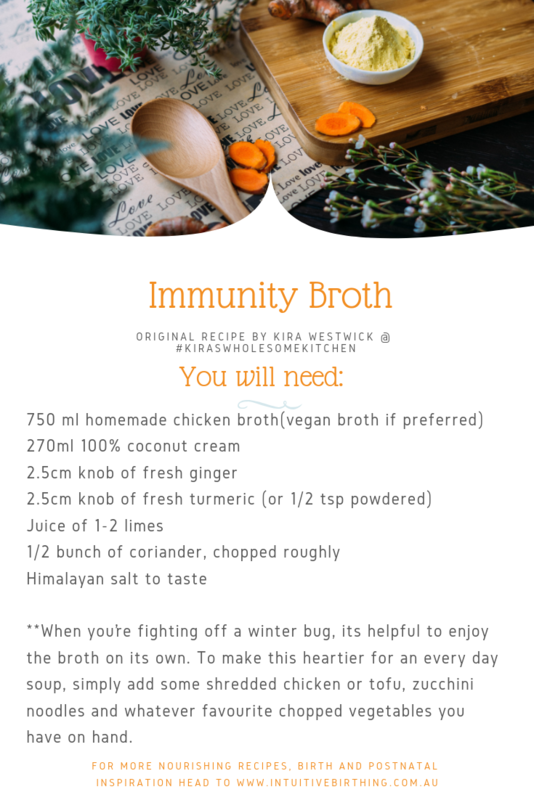 So here it is, the delicious Immunity Broth recipe that will be your ‘go-to’ this winter. This is one of the recipes I make in advance for my postpartum clients, its wonderful to have on hand in the fridge/freezer for a quick snack or meal. A big thankyou to Kira Westwick for allowing me to share her most wonderful recipe with you. Let me know if you love it as much as my family and my clients do!